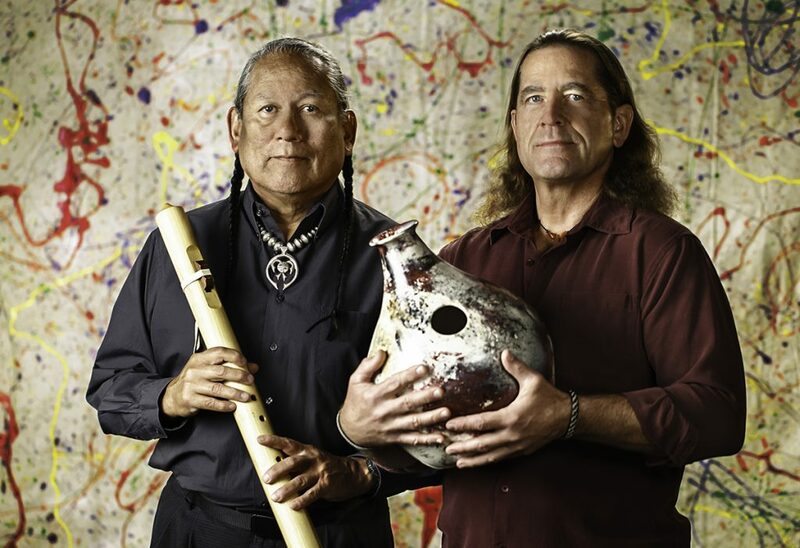 Pacific University welcomes Native American flute master R. Carlos Nakai to Forest Grove on Saturday, April 6 for the fifth and final installment of the university’s 2018-2019 Performing Arts Series. The concert begins at 7:30 p.m. and takes place in McCready Hall of the university’s Taylor-Meade Performing Arts Center (2014 Cedar Street). Nakai is among the world’s premier performers of the flute, having recorded more than 50 albums in exploring a mix of new age, world-beat jazz and classical music. He remains the only Native American artist to earn two gold records, and the first performing traditional solo flute music to go platinum. Of Navajo-Ute heritage, Nakai began his musical studies on the trumpet, but a car accident ruined his embouchure. He subsequently received a traditional cedar flute as a gift with an accompanying challenge to master the instrument. While cognizant of the traditional use of the flute as a solo instrument, Nakai began finding new settings for it, especially in the genres of jazz and classical. He founded the ethnic jazz ensemble, the R. Carlos Nakai Quartet, to explore the intersection of ethnic and jazz idioms. The 2005 inductee of the Arizona Music & Entertainment Hall of Fame is also co-author of The Art of the Native American Flute, a guide to performing the traditional cedar flute. Nakai will be joined on stage by percussionist Will Clipman. Admission is $25, and discounts are available to senior citizens, students and Pacific employees. Tickets may be purchased in advance by calling 503-352-2918. Pacific’s Performing Arts Series has been an entertainment staple of Washington County since 1994 and has featured performances by some of America’s most recognized names, including Ed Asner, John Sebastian and the Harlem Gospel Choir. The Performing Arts Series is sponsored by Tuality Healthcare – An OHSU Partner, R.B. Hornberger Company and U.S. Bank, with additional support from Wauna Credit Union, Diversity Cafe? and Best Western University Inn & Suites (Forest Grove). Pacific University is a diverse learning community, where students thrive in a personal academic environment. Students study in a unique combination of undergraduate, graduate and professional programs in the liberal arts and sciences, business, education, health professions and optometry. Located in Oregon, Pacific serves a diverse population of more than 3,900 students, with campuses in Forest Grove, Hillsboro, Eugene and Woodburn, as well as healthcare clinics throughout the Portland area. Pacific is currently ranked the No. 1 private research university in the Pacific Northwest and is also committed to civic engagement, sustainability and interprofessional education as part of its core teaching philosophy.